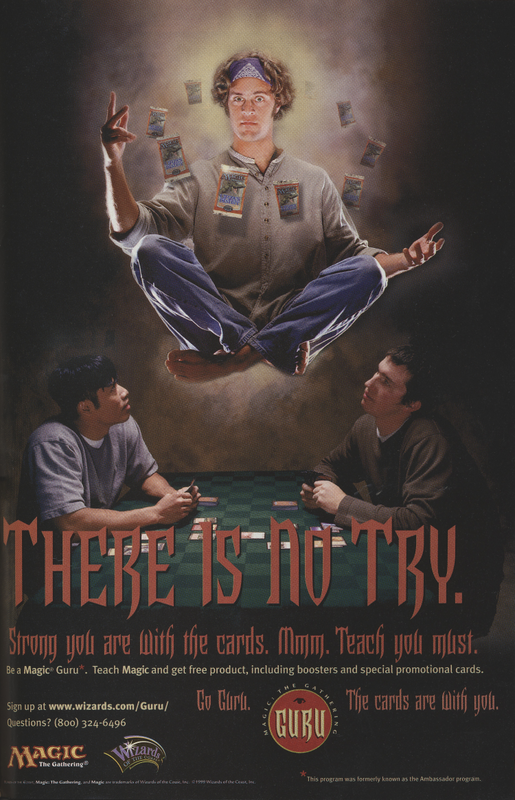 The Guru program was initiated by Wizards of the Coast at the 12th of July in 1999 to promote Magic more effectively. 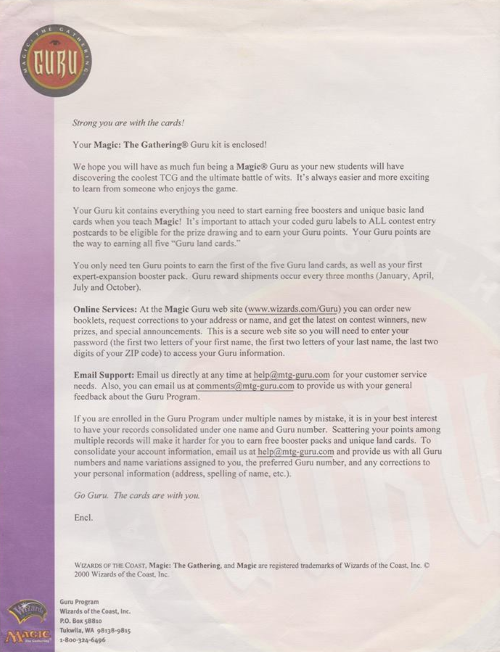 Participants in the Guru program received a Guru kit which included a Guru book to explain how the program worked, personalized Guru labels, new player referral postcards, and Magic Guru referral cards which looked like a real Magic card. 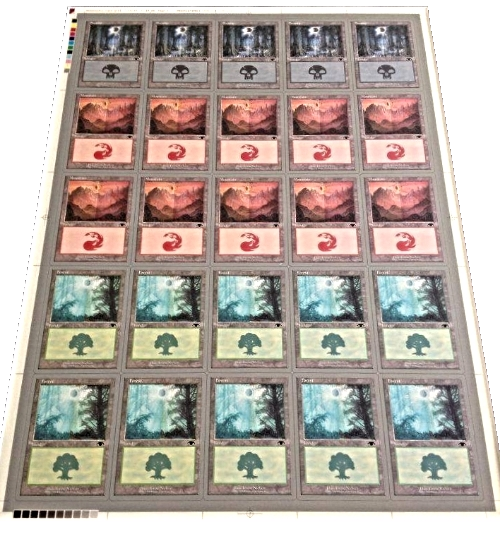 Additionally, special Demogame boosters of Starter level Magic sets and playmats were added on demand. The design of the Guru book changed over time. Gurus could report new players by sending in one of the new player referral postcards, filled out by the new player and individualized by one of the Guru labels. 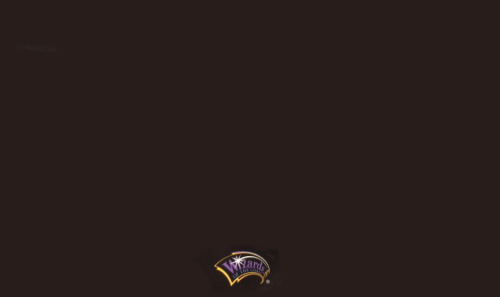 The new player was then registered in a database and the Guru received 1 Guru point for his work. Additionally both the Guru and the new player were entered into a contest with quarterly prize schedules. Gurus could win a booster box of the current expert level set, new players had a chance to win a $100 US gift certificate which could be redeemed at selected stores. 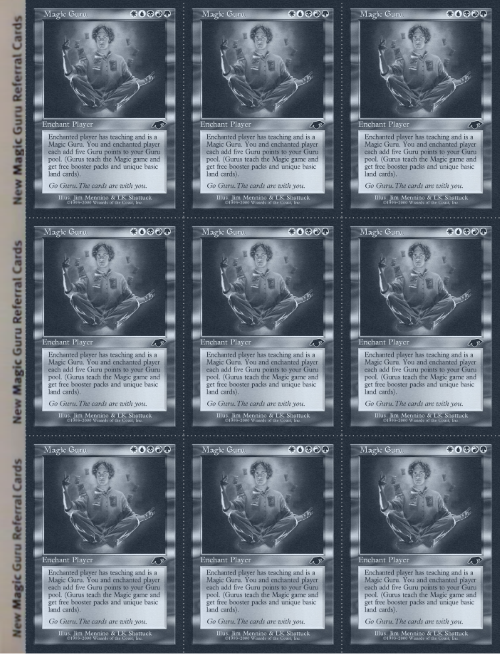 For every 10 Guru points, the Guru received one randomly chosen Guru land and one booster of the latest expert level Magic set. 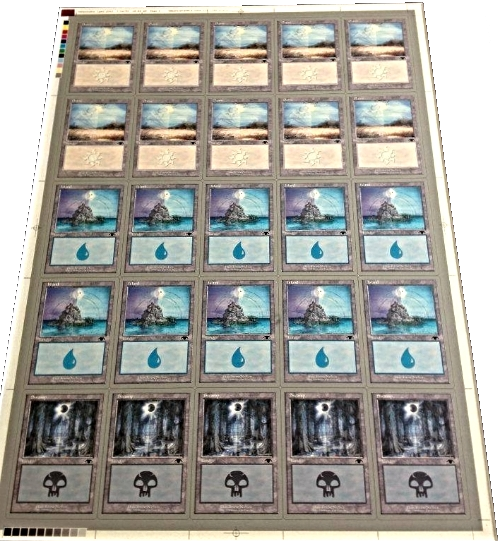 Wizards of the Coast kept a record which lands had been rewarded to insure that after 50 Guru points each Guru had a complete set of Guru lands. 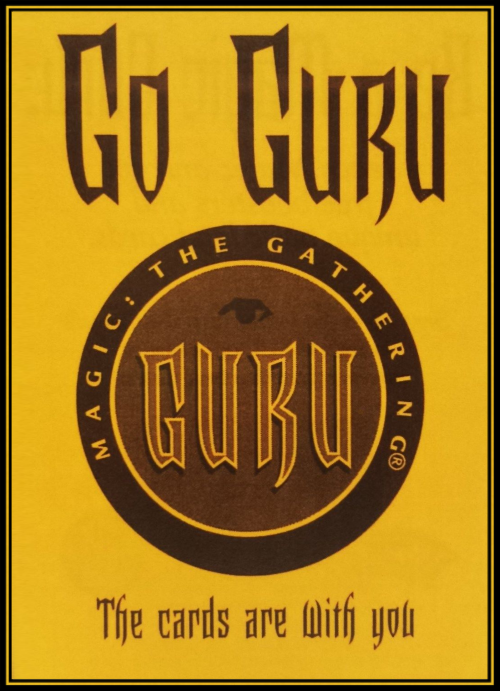 The Guru program was discontinued on February 27, 2001 to be replaced by the Magic: The Gathering Academy. The Guru lands show five stages of a "double eclipse". Special Demogame boosters used during the Guru program. Portal Demogame booster: WOC17024 Made in the U.S.A.
Portal Second Age Demogame booster: WOC17043 Made in the U.S.A.
Starter Demogame booster: WOC17077 Made in the U.S.A.
Starter 2000 Demogame booster: WOC17085 Made in the U.S.A.
Guru Kit Book 1. Tools of the Guru! 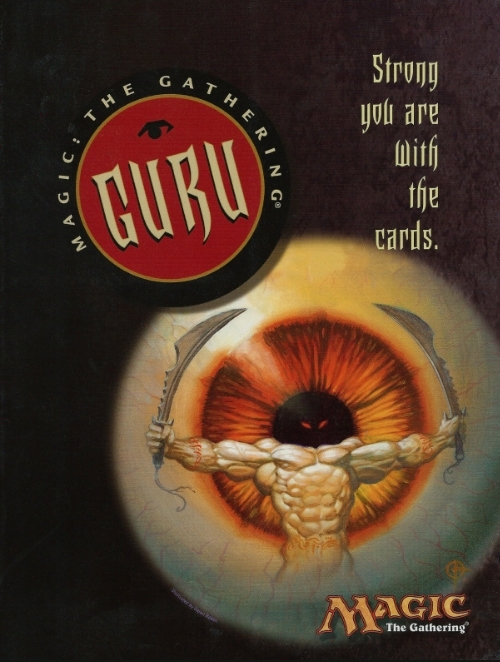 This version of the Guru book does not include the Magic Guru refferal cards. Guru Kit Book 1 (1999): Illustration Trained Orgg from Starter 1999 by Eric Peterson front and back. 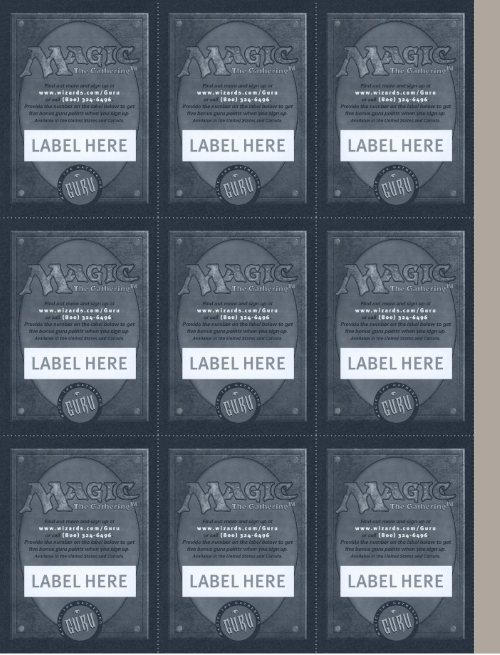 Magic® Guru customized labels front and back (Guru Kit Book 1). Sealed Guru Starter Demo Games front and back (Guru Kit Book 1). 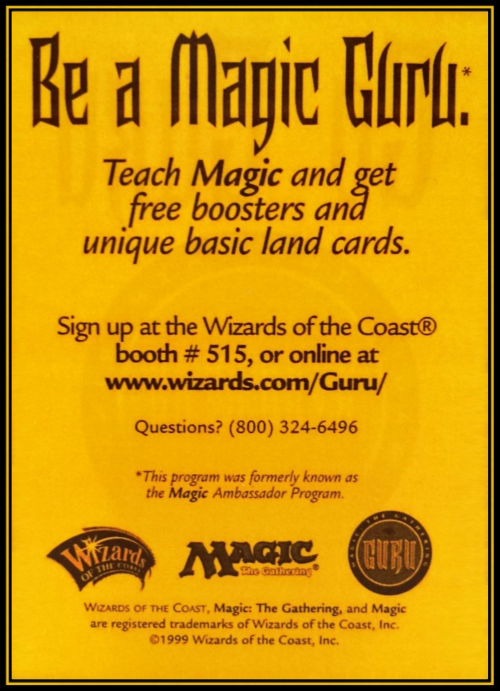 "Free Magic booster" rebate offers front and back (Guru Kit Book 1). 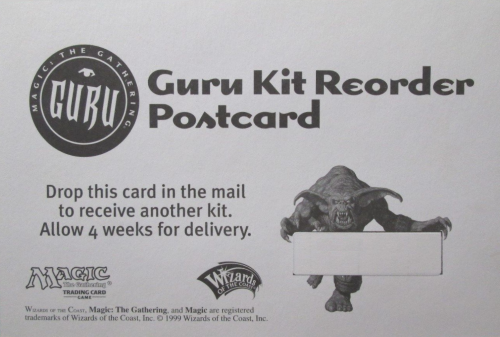 "New Magic Player" contest registration card front and back (Guru Kit Book 1). 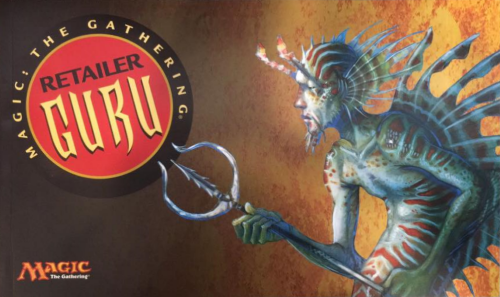 Guru Kit Retailer Book 2 (1999): Illustration Merfolk of the Pearl Trident from Starter 1999 by DiTerlizzi front and back. 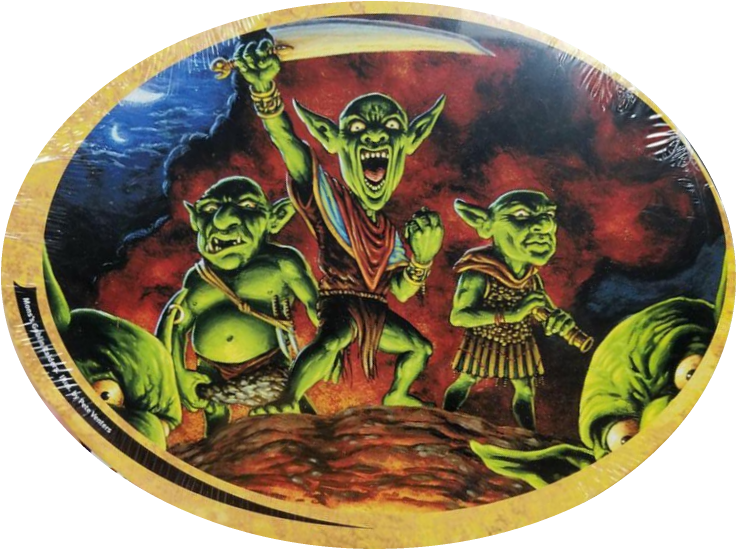 Guru Kit Retailer (1999): Sealed Magic: The Gathering "Learn to play Magic" ceiling danglers illustration Mons's Goblin Raiders from Starter 1999 by Pete Venters. 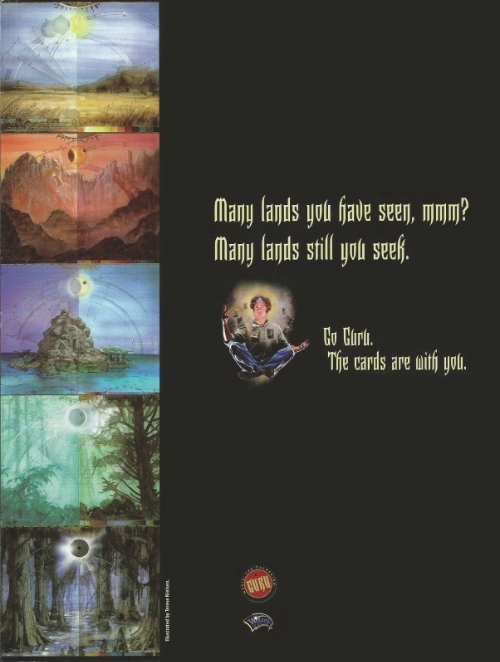 Guru Kit Book 3 (2000): Magic Guru refferal cards sheet 3 x 3 with 6 different variants front and back (only in Guru Kit Book 3). 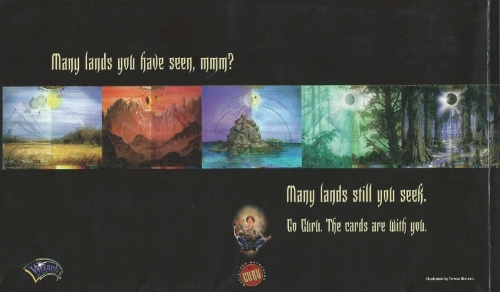 Guru Kit Book 3 (2000): Reorder post card. 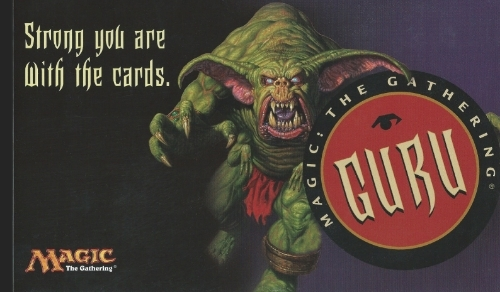 Go Guru WotC Booth card (1999) front and back. Guru Test Prints uncut sheets 1 and 2 with grey borders and white backs from July 14th, 1999. 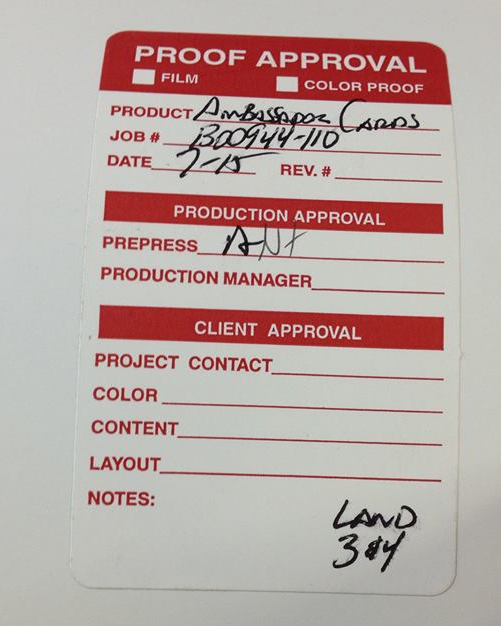 They were called "Ambassadors Lands or Ambassador Cards". Guru top of the Test Print Sheets. Guru black symbol on the front of the Test Print sheets. Guru Proof Approval sticker on the white back of the Test Print sheets. Guru Lands Full Art by Terese Nielsen.